Focus for the Mac ($19.99) and iPhone/iPad ($4.99, universal with Apple Watch support) is a productivity timer with several thoughtful little touches. It fits nicely with how I like to work, and I believe several of you will like it, too. There is no shortage of Pomodoro timer apps, including the very nice, browser-based Focus Booster. The analog among you can even buy a physical tomato timer if you like ("pomodoro" is Italian for tomato). So why choose Focus? There are some niceties here that make it stand out. On the Mac, Focus looks great. It offers both a light and dark theme (I prefer the dark), and information is clearly presented: Tasks on the left, timer next to that and, optionally, a history of your work activity on the far right. You can sort tasks by completed/outstanding, and adjust the length of a timer on the fly. 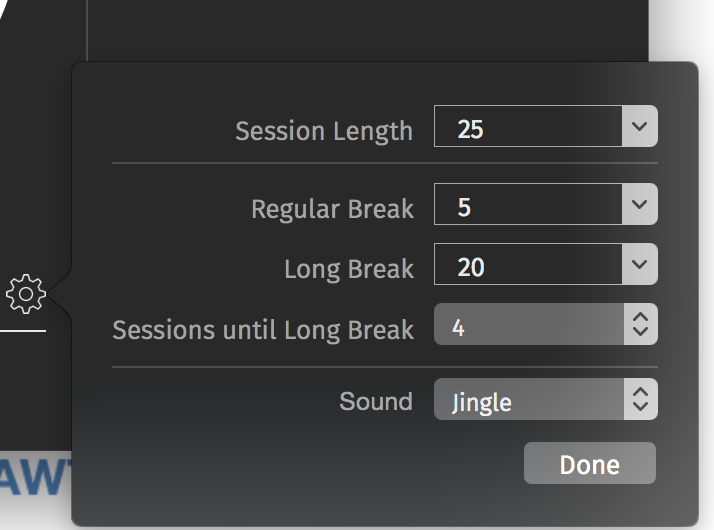 You'll also find buttons that let you pause, restart or skip right to the end of a session. There's a menu bar item that I like as well, which can optionally display a countdown timer, a pie chart that is gradually filled or both. I find the ever-changing numbers distracting, but that's me. It provides almost all of the information found in the app's main screen. "As a long-time Apple user I wanted Focus not only to work on all my devices (iPhone, iPad, Mac and of course, Apple Watch) but to work seamlessly together. When you use the different versions, you see very much of the same UI elements: the colors, the custom font (Fira Sans btw), the blue circle. Yet Focus adapts to system-specific behavior like a Today Widget on iOS in contrast to a menu bar item on the Mac (we had a Today Widget for the Mac in testing but quickly learned that Focus on the Mac works much better in the menu bar)." "With iCloud and Handoff, you can simply start a work session on your Mac and grab your iPhone to continue." And that's something that I love about Focus: Handoff support. I like to leave my desk during my break periods and walk around the yard, play with the dog and so on. Now I can simply grab my iPhone, slip it into my pocket and wait for the end-of-break notification to sound. No more finding a second timer away from my desk, just to monitor breaks. That's very handy. Apple Watch support makes this easier still, as I get a little tap when it's time to get back to work. "My brothers share very much of my passion for productivity and design. My youngest brother Malte is 17 and started to code with 15. He is very talented and contributed a lot to Focus for iOS. Niels is 21 and he currently studies computer science and business. He is responsible for a lot of the administrative stuff. Working as a team is a lot of fun since we share a lot of interests. But it is also quite challenging because you sometimes have to separate between work and family. For example, a family birthday is not a Focus team meeting!" This is a very nice app that fits beautifully into my work day. It looks great, is legible and clean, is intuitive and the Handoff support puts it over the top for me. Yes, there are many productivity timer apps out there. Focus is one you should definitely use.